Elena Kolesnikova is president and founder of the Russian Connection Unlimited (RCU), a New York-based translation and interpreting company. Accredited by the American Translators' Association, Ms. Kolesnikova is currently one of the leading professionals in her field. Her company, RCU, has successfully provided language services for private and government clients and statesmen in the United States and in Russia for over 25 years. Ms. Kolesnikova has coordinated simultaneous interpretation at such international events as the Caspian Pipelines Conferences in 1997 and 1998, Sachs - Bloomberg Investing in Russia Conferences in 1998 -2003, Annual Members' and Directors' Meetings of the U.S. - Russia Business Council in 1997 - 2018, World Congresses of the International Newspaper Marketing Association in 2005 – 2015, and others. The Russian Connection Unlimited has participated in the translation of such published books as Hidden Treasures Revealed (Harry Abrams Publishing House), Solzhenitsyn Files (Edition Q), and Marketplace: A Brief History of the New York Stock Exchange. Ms. Kolesnikova was born in Russia. She attended high school and got her B.A. and M.A. in translation studies from the Institute of Foreign Languages in Moscow. For 12 years, she was a professor at the department of translation in her alma mater, where she received her Ph.D. in 1987. Ms. Kolesnikova combined her teaching career with translation and interpreting providing services for the Moscow Olympics, International Tchaikovsky Competitions and International Film Festivals in Moscow. She is the author of many articles on various topics related to translation and semantics. 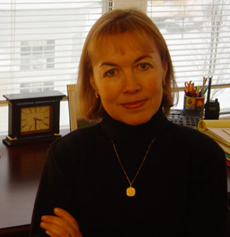 After moving to New York in 1988, Ms. Kolesnikova taught several courses in translation and interpreting for the United Nations staff members, as well as Russian language courses at the School of Continuing Education at NYU. At the same time she pursued the career of a free-lance translator and interpreter. In 1994 she founded the Russian Connection Unlimited and now devotes all her professional time to running the company. © 2003 - , Russian Connection Unlimited - All rights reservedWebsite design, hosting, and maintenance by New Tech Web, Inc.